In this workshop, you will learn how to enter the research community, including strategies for choosing a research area, identifying faculty mentors, and available campus resources. The workshop will include a student panel discussing how they got involved in research and a faculty panel to discuss what faculty look for in students to mentor. This workshop will fulfill a CRSP workshop requirement. Once you have a research area in mind, you will want to understand where your research fits in the scholarly conversation. Join librarians from the University Libraries to get ahead on navigating research databases and finding the best articles. You will have time to work on your own research, so please bring your laptop. This workshop will fulfill a CRSP workshop requirement. Zotero is a free citation management tool. It keeps track of your sources as you do your research. When it’s time to write a paper, Zotero can handle the citation formatting for you. This workshop will show you how to install Zotero, sync your references to a free online account, and use it with Microsoft Word. This workshop will fulfill a CRSP workshop requirement. 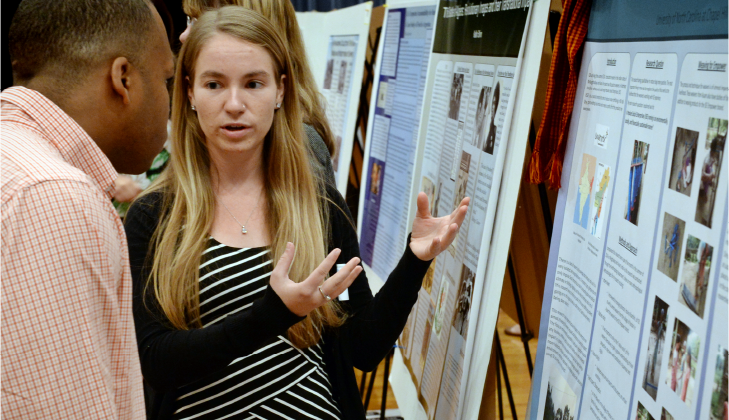 Get ready for the Celebration of Undergraduate Research or other symposia this Spring and create an academic poster that stands out in the presentation hall! In this workshop, learn the design principles and guidelines that will help you create an effective and aesthetically pleasing poster. We’ll discuss layout, fonts, colors, graphics and more. This workshop will fulfill a CRSP workshop requirement. BeAM@CAROLINA is a network of makerspaces where any UNC student, staff, or faculty member can join the UNC maker community in the design and making of physical objects. Get help with your research projects, whether that’s iterating on studio art techniques, building instruments for scientific experiments, or prototyping entrepreneurial inventions. Enjoy spaces equipped with emerging technologies like 3D printing and laser cutting, along with areas dedicated to sewing and woodworking. A schedule of trainings offered by BeAM can be found here. The Undergraduate Libraries offers multiple workshops for students that may be useful in your research. These include Introduction to Adobe Graphic Design, Working with Data in Excel and Illustrator I: Draw Shapes and Icons. Visit the Workshops at the UL page here for more information.